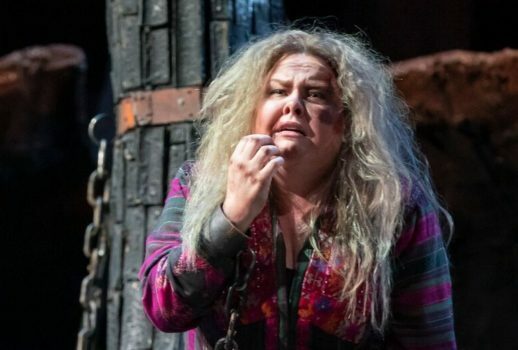 If sheer clarion vocalism is what draws you to the opera, then hie thee to Lyric Opera of Chicago’s rousing revival Of Verdi’s Il Trovatore, the oddly plotted but musically sublime opera that opened last night in the David McVicar production, originally seen in 2006. Of course, Caruso famously said that all it takes to make Trovatore a success is the four greatest singers in the world. I’m not sure about the “four best in the world” stuff, but Lyric provided the finest, best matched group of lead singers that I can imagine singing today. Il Trovatore is full of glorious melody, soaring arias and duets one right after another. 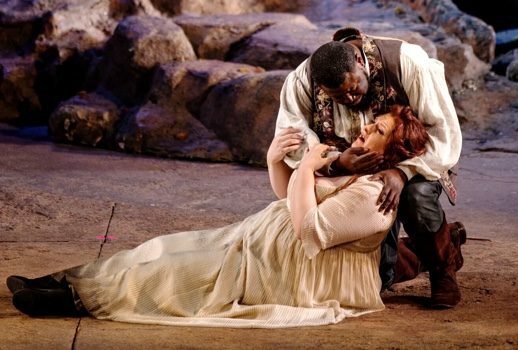 Soprano Tamara Wilson made a spectacular Lyric debut as Leonora, the unlucky noblewoman in love with the rebel Manrico while spurning the advances of the cruel Count di Luna. Wilson met all the extensive vocal demands of the role with ease and power. She had it all—shimmering pianissimos in her opening area “Tacea la notte” completely with remarkably accurate runs and trills sung with pure tonal beauty in the cabaletta “Di tale amor”; power and grace in the potent “Miserere” scene; steely determination expressed in laser-like high notes in her duet with the Count. She brought admirable nuance to her characterization. One might have wished for more physical expressivity, but her vocalism was stunning. Jamie Barton certainly laid claim to being the Azucena of her generation. The voice has bloomed and become more powerful, and last night she deployed a lower register that I hadn’t heard from her before. She sang and acted with beauty and skill, and the contrast between her lust for vengeance for her mother’s death and her maternal protectiveness toward Manrico has never been clearer. Her “Stride la vampa” in Act Two was a model of dramatic vocalism, yet she was able to sing softly and ravishingly in Act Four’s “Ai nostri monti” when the imprisoned Azucena longs for her previous life in the mountains. And her rendition of the opera’s final line “Sei vendicata, o Madre!” was chilling and raise goose bumps on this reviewer. 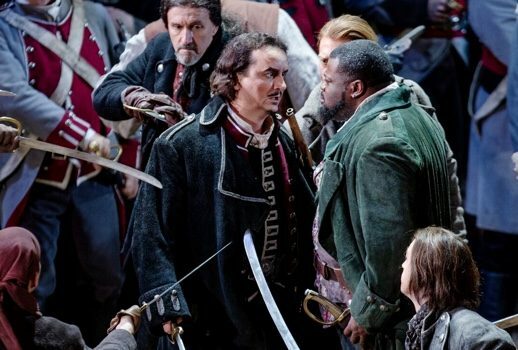 Tenor Russell Thomas was a heroic Manrico, bringing stentorian power throughout. Like Ms. Wilson, he had all the tools for a successful Manrico in his pocket, singing with a stunning intensity. He provided a stirring “Di quella pira”, much aided by the men of the Lyric Opera Chorus, and if his high C at the end was effortful, it was a thrilling musical moment. Thomas was less successful with the softer aspects of the character, his “Ah si, ben mio” lacking in sweetness and reflection. Count di Luna was sung by Polish baritone Artur Rucinski in his Lyric debut, and he, too, sang ardently and beautifully with a voice quality that reminded me of the late Dmitri Hvorostovsky. And while he lacked some of the physical expressiveness and acting skills of that great baritone, he sang a ravishing “Il balen” in Act Two and held his own with his powerful cohorts in duet. It was a solid, if somewhat stolid, Count di Luna, and I hope to hear more from this talented artist. The supporting cast was equally fine, beginning with Roberto Tagliavini’s Ferrando. Cutting a dashing figure, Tagliavini’s cavernous bass brought clarity and power to the long exposition of the first scene. And I was shocked by the size and beauty of Lauren Decker’s contralto as perhaps the most effective Inez of my experience. I had heard Ms. Decker previously in several small roles at Lyric, but here she makes a major step forward. Mario Rojas is the loyal Ruiz. The McVicar production is beginning to show its age. Charles Edwards’ dank, gloomy set has become a bit creaky—the turntable shifts between each scene seemed interminable and actually harmed the flow of the drama. The Goya-inspired production seemed more two-dimensional than before, despite the inspired lighting of Jennifer Tipton (designed for the revival by Chris Maravich). Revival director Roy Rallo kept the proceedings moving, but there were a few too many “go downstage center and sing to the audience” moments for my taste. Only in the military camp scene that begins Act Three were the chorus deployed in an interesting series of vignettes; through much of the piece the chorus, too, was required to face front and deliver. It’s a very “old school” production, but with singing of this caliber, I really couldn’t complain. Verdi was very well served on Saturday night in Chicago. Photos: Todd Rosenberg (Barton); Lyric Opera of Chicago.